In addition to Beth, Melanie Green, Brima Jah, and Chastity Davis join Dia and Danielle for this inspirational month of study. Melanie has an open heart, is fiercely devoted to justice, the co-founder of Berkeley Yoga Center, and deconstructs Ashtanga for both new and seasoned practitioners. Brima exudes love, dances like no one’s watching, serves as a mental health case manager, and practices his devotion in the everyday moments of life. Chastity brings her work in Reconciliation and her international offerings of Heart Centred Leadership. With a Masters degree in Arts Integration, ten years as a racial equity professional and twenty-five years of yoga experience, Dia Penning supports students in slowing down, examining limiting patterns, and exploring creativity. 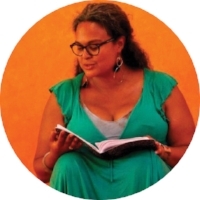 She views yoga practice and philosophy as a foundation for social change, integrating both into her work as an equity and justice curriculum writer and coach. Dia encourages a deep exploration of structural inequity through personal transformation and paradigm shift. She has consulted for a variety of clients including universities, museums, municipalities, and corporations and is the founder of The Equity Collective. Danielle Hoogenboom founded Love Light Yoga as an expression of her yoga practice and creative interests both on and off the mat. She is passionate about yin yoga and its ability to heal, change and transform ourselves and the world around us. Believing that all people are invited to the healing of yoga, Danielle teaches a diverse schedule of classes and workshops that range from the practical theory to the mystical and sacred parts of yoga. She is certified in many styles and has been teaching yoga for 10 years. She teaches in studios across Vancouver and often travels aboard to share, celebrate and connect. She teaches Yin Yoga workshops worldwide sharing her passion for a gentle, steady practice. Chastity is a mixed heritage woman of First Nations and European descent. She is a proud member of the Tla’amin Nation, located in Powell River just off the beautiful Sunshine Coast of BC. She strives to keep her sacred First Nations culture, traditions, and values incorporated into her modern day life. She has dedicated her life to facilitate the building of bridges between Indigenous and non-Indigenous people. Beth is the grateful owner of Alameda yoga studio: Leela Yoga, which she opened in 2013. She has been a student of yoga since a knee injury in 2001 and an instructor since 2008. Beth is certified to teach hatha yoga, prenatal and postnatal yoga and yoga for pelvic health. Her teachers include the greats Jane Austin and Leslie Howard. Beth teaches mindful flow, prenatal and postnatal classes at Leela Yoga. Beth's experiences with pregnancy, and the birth of her own three children brought her to specialize in prenatal/postnatal and yoga for pelvic health to fill a glaring gap in health care. With her expertise she offers educational workshops on the female pelvic floor and often works one on one with students who to rehabilitate pelvic issues of all sorts. Deposit and payments are processed through Pay Pal, and you will receive instructions following the application process.